in Guy's Burger Shack aboard selected Carnival ships in the future. Carnival Cruise Lines has a new half-billion-dollar initiative that represents an evolution of the brand which they are calling Fun Ship 2.0. It's bringing aboard a number of "branded" products, mostly via celebrity names. Carnival is using the branding in a quite different way than most lines have. 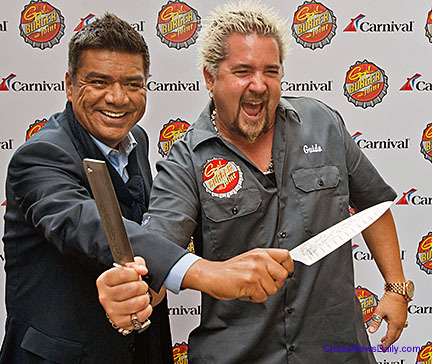 The two highest profile celebrities are television chef Guy Fieri and comedian George Lopez. Neither will personally appear aboard any cruises, however. name to the line's comedy clubs. 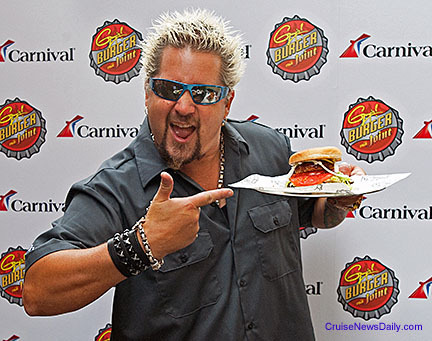 Fieri will lend his name to a gourmet burger stand aboard selected ships, while Lopez will work mainly behind the scenes helping Carnival select comedians to appear onboard, but allowing the line to use his name to promote their comedy clubs. It will be some time, however, before the Fun Ship 2.0 features debut aboard all the ships. Dates are tentatively scheduled through 2015, and even at that, not all ships in the fleet will be completed. Fun Ship 2.0 also seems to be seeking to change the line's demographics. Will it work for Carnival? The complete article appeared in the October 3, 2011, edition of Cruise News Daily.